What can I say? I’ve been converted to a Gleek. For some reason I had no interest in the musical dramedy Glee. That is until this season. Now I find myself looking forward to Tuesday nights, turning on the surround sound, and just giving in to the sheer glee of watching Glee. I love all things musical and still haven't seen a single episode of this show!! I always seem to be at work when it's on. Must try and catch up somehow!! I have to admit I have been converted as well! My friends kept talking and talking about it until I ended up buying the DVD of the first series and watching all of the episodes in one long night! I have to say I'm not as impressed with the episodes in the new series so far though (except for the Madonna one). I must be one of the last few people who is not a Gleek. I just have not watched the show, so truthfully, I have no idea whether I'd love it or hate it. I've just been too obsessed with LOST and the Housewives lately to get into a new show. I might have to watch a few episodes online to see what all the fuss is about, because I do enjoy a good musical. Plus, everyone I know loves the show! Is it really that great? Don't be embaressed-just give in! 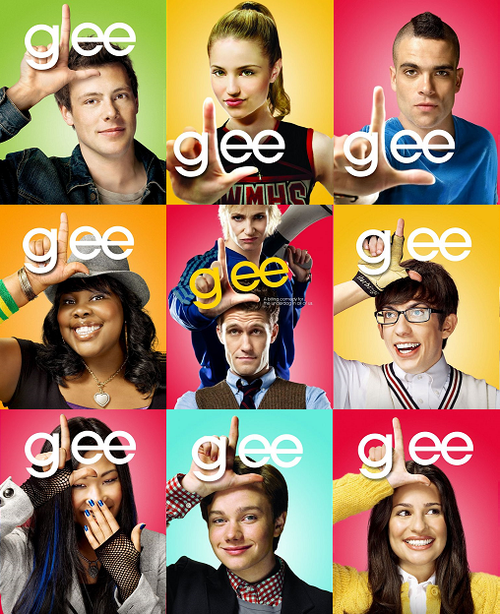 I love glee (although the term gleek is new to me). I had to take fifty steps back after I discovered how fun it is to watch this show. I kept teasing friends who watched it but I soon caught on. It's one of those 'it's so bad but good' shows. I love Sue and Schu! @Nadia – I LOVE Lost! I'm losing my mind that it'll all be over in less than a week! hi again thomas – sorry did not mean to restart the revolutionary war! i'm afraid i don't know glee either cause at our house it's mostly bbc america! i know what you mean about feeling a bull in a china shop in the uk. i'll be diplomatic and say there should be an island in the atlantic for all of us “in-betweeners”. Elise: It's worth checking it out. Karen: It happened to me the same way. Nadia: Well you kind of have to like musicals and suspend your disbelief. AD: Oh yeah, I let go of the embarassment. I've given in. Mad Bibliophile: I think “fun” is the best best way to describe it. Mlle: It's called Bermuda! The Queen's portrait is on the wall of the airport and they use American dollars everywhere. But I guess it is much closer to the US than the UK. Only about 2 hours from DC. And what beaches. Feel no guilt whatsoever Thomas, I am hooked! Thomas – I watched a clip of the show online and was floored by the singing! They are awesome! @madbibliophile – I know what you mean! I can't believe that it is all going to be over so soon. I keep reading that the cast described the ending as beautiful – what does that mean? My guilty pleasure! Sue Sylvester is such a brilliant character, and Jane Lynch is hilarious as her. Just began watching on dvd last evening – we loved it!